1. Fry the onion in the oil over a low to medium heat for 10–15 minutes, until softened but not coloured. 2. Mix well with the remaining ingredients. 3. Divide into 4 then form into burger shapes. Chill in the fridge for a couple of hours. 4. Meanwhile, make the raita. Squeeze the grated cucumber and discard the excess water, then mix with the remaining ingredients. 5. Cook the burgers on the barbecue for 10–15 minutes, until cooked through. 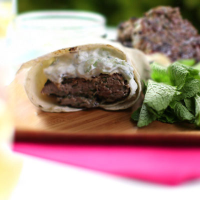 Serve with the raita in a wrap or bun. This recipe was first published in Wed Jun 05 14:21:24 BST 2013.